I am a former military officer having served two tours of duty in Vietnam. I recall my oath of office to uphold the Constitution. It is not an oath to support any particular group of people, or a gang of criminals exercising authority outside Constitutional boundaries. What kind of country would we live in if political and military leaders could do what they wished while suppressing public information and without legal restraint? Bradley Manning has, in my opinion, bravely risked his life and freedom as a matter of conscience to help Americans restore the rule of law in their society. He has revealed crimes committed by our government that we, the people, did not, and would not have authorized. This is a matter that cries out for justice. If we continue to pass legislation favoring certain financial elites and punishing those who reveal the crimes of state in service of those same elites we will have an unfair and unstable society. The same is true in the application of what is called justice. 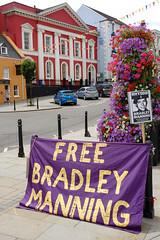 You have an opportunity to obey your oath of office and duty to the Constitution to free Bradley Manning. That might come at some professional cost in the short term, but, believe me, the American people would remember and forever respect your act of courage. I believe that it should never be a crime to disclose a crime committed by a public official and every public official should be accountable for crimes committed in office. The American people have not agreed to hire criminals to conduct their affairs of state and would not do so if posed with such a choice. Please choose the right thing. We will remember this. I will personally lobby our government to strip all who committed or condoned crimes while in office of all government benefits, including retirement. We (the American people) will not reward people for committing crimes. Please note that General Buchanan can be contacted at jeffrey.s.buchanan@us.army.mil. If any reader of this message feels moved to also contact him, this e-address is the venue to use. This entry was posted in All Posts News Politics and-or Videos, Crime and or Corruption, Dandelion Salad Guest Writers, Politics, War Crimes and tagged Chelsea Manning, Manning-Bradley, Peter Hollings, Whistleblowing, WikiLeaks. Bookmark the permalink. The ‘powers that be’ have already reached that point: doing as they well please and going after anyone who dares shed light on their shenanigans. Instead of persecuting the intelligent dissenters and those who are driven by conscience or what they perceive to be their moral duty, the government should respect and heed them. Moreover, if the officers of government were indeed wise, they would formally recognize those dissenting individuals’ courage and potential contribution and invite them to engage positively to further the best interests of society. Why restrict a potentially invaluable human asset? The same can be said of all political prisoners, those who are censored or censured for their views or actions ~ unless they are obviously motivated by criminal intent or clearly deranged, deluded and misled by deceptive and illusory cognitive bearings. The latter more aptly describes the state of mind of numberless elitist tyrants and tycoons. Thanks, David. It makes too much sense (what you wrote). The government must condemn him and other whistleblowers strongly/severely so as to (hopefully) prevent more whistleblowers. I don’t think that works, but that’s what the intention is of the present government. I know it Lo, and it is a truly appalling indictment when we realize that the very people who should demonstrate exemplary courage and ethics are so morally bankrupt, and seduced into complicit conformity. How can they command any respect, when all they deserve is contempt? Wake up calls are needed when one is asleep at the wheel. I doubt that the General Buchanan fits into that mold. High powers of consensus are against Bradley Manning and the powers that be are dead set on keeping that way. Public opinion is scoffed at. So what more can be done? Send out a letter stating the same and ask the readers to click on and sign their names.